Day one: Pick up at the airport and transfer to Kigali. Check in at Golf Hills Residence Hotel; refresh and rest a bit before starting the afternoon Kigali City tour which introduces you the pre-colonial history of the country, colonial and post-colonial history and vision 2020 by the Rwanda government. Day 2: Transfer to Kibuye; en-route visit Nyange Secondary school where students were killed by genociders because they refused to divide themselves based on ethnic groups. Also visit catholic churches that were bull-dozed by the Interehamwe with the support of some priests. Check in at Moriah hotel; refresh and enjoy lunch on the shores of Lake Kivu. Afternoon, enjoy a boat ride on lake Kivu to go visit the Amahoro Island (Peace Island) where thousands of Angolan bat species dominate the clouds then visit Napolean’s Hut Island. Evening; enjoy traditional dinner on the island. Back to the hotel. Day 3: Transfer to Gisenyi; en-route experience the real rural lifestyle of Rwanda unchanged for centuries. The drive is on a bumpy road but not that bad. It takes 4 hours to arrive in Gisenyi. Enjoy lunch at Kivu – Serena or Parades Marahide Hotel which is more ecofriendly. Optional: afternoon tour of Gisenyi city; the hot springs, fishing village and the solidified lava flow from the Democratic Republic of Congo (DRC). Overnight at Kivu Serena hotel or Parades Marahide hotel. Day 4: Transfer to Ruhengeri. On arrival, check in at Gorilla hotel. Afternoon, visit Kinigi Cultural Village and experience banana and sorghum beer production or visit the traditional healers (ethno botany experience) or bio mimicry experience in Musanze. Overnight in Musanze. Day 6: Transfer to the Uganda via Kisoro; check in at Mgahinga Lodge. Refresh and rest waiting next day’s hiking of Mgahinga volcano. 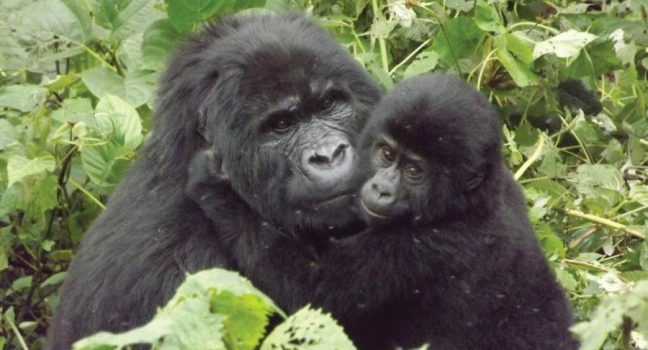 Day 9: Early morning game drive and drive to Bwindi Impenetrable N.P. Overnight at Gorilla Forest Camp. Full Board. Day 11: After your breakfast, drive to Lake Mburo N.P via Mbarara on any route. Lunch in Agip Motel and an overnight at Eagle’s Nest Camp. FB. Day 12: Then early morning, have a game drive and in the afternoon, have a boat ride at Lake Mburo then drive to Queen Elizabeth National Park overnight at Bush Lodge. Day 15: Transfer to Kibale Forest N.P en-route Fort Portal town for lunch. Optional: Overnight in Rweteera Safari Park. Day 16: After your early breakfast, briefings from the Park authority then depart through Kibale Forest for Chimpanzee trekking. Proceed to Kasese town, overnight at Sandton Hotel. Day 19: Depart to Murchison Falls N.P, with any route game drive, an overnight at Red chili Rest Camp. Day 21: Drive to Kidepo Valley N.P. Overnight at Apoka Lodge. Day 23: Depart from Kidepo to Kampala via Ziwa Rhino Sanctuary, overnight at City Royal Resort Hotel in Kampala. Day 24: Relax in Kampala; City tour, shopping etc. Overnight at Forest Cottages in Kampala Central. Day 25: Transfer to Entebbe Airport.